EDIT: If you are looking for a low-cost silent counter to use on a skein winder, try the countinator from Noelle’s Noodles. I’ve had a few skeins to wind off lately, which is good news, because I’ve been winding them off for paying customers! I had a little problem with the counter on the skein winder, which was fixed with excellent after sales service from Ball & Skein. So the counter was working perfectly, but like all manual counters, it was a bit noisy. Over Saturday lunch we brainstormed the problem with some friends of ours, and they suggested an odometer, and further a bicycle odometer! 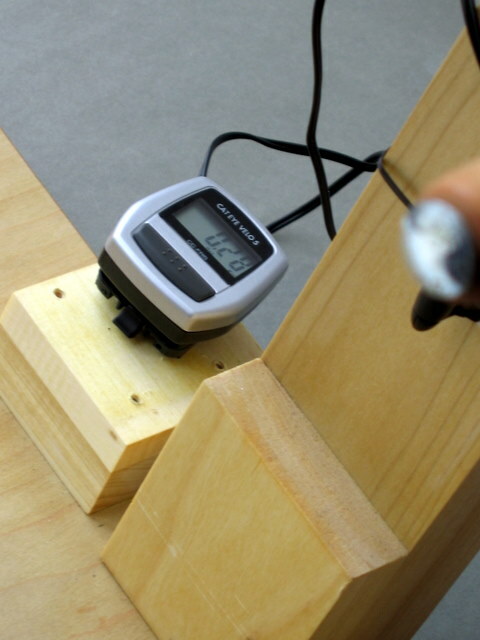 Electronic bicycle odometers work by measuring the number of rotations of a magnet past a reader. Saturday night we went off to Mongkok to find a cluster of bicycle shops that are located in the aquarium district. The fish food shops need to be smelt to be believed. I purchased the cheapest odometer in the shop, fitted it to the skein winder, and it works. The reader is attached the main upright of the skein winder, and the magnet is attached to one of the arms. There were a few technical issues in the implementation – the bicycle odometer does not measure rotations like the old counter. It measures the distance travelled by a notional wheel (you can specify the diameter). I had to return to early high school maths, and figure out what size bicycle wheel (measured across the diameter) would have the same circumference as a single skein wound on the winder. Once I knew that, I could use the trip meter to figure out the length of any skein that I have wound off. 0.28kilometers is 280 metres etc. It’s very accurate and perfectly quiet, and I think that the skein winder is now quite a bit quicker. If I had looked around, I would have seen that on Ebay people are selling (generic) odometers with similar functionality for US $ 1. While I didn’t break the bank on the purchase, it wasn’t quite that cheap. I don’t have any knitting news. I’ve abandoned ship on the Christmas knitting projects (iTunes vouchers for all! ); and have been plugging along on a Debbie Bliss pattern (its an ill formed unphotgraphable lump at present) and a very boring pair of socks. I’ve just been told that the Hong Kong knit bloggers are meeting on Saturday, so I am going to try to knit like the wind to get the vest finished for that. Saw your post on Ravelry. This is so cool! I am stuck with the math part and can’t figure out how to do it. My odometer is counting by 2s and if I speed up the winding it counts by 3s or even skips numbers all together!